Growing oregano yourself is an easy and sure way to ensure you always have a supply of one of the most popular herbs in the world. You just can’t make delicious Italian dishes without it. And it's key to pasta, pizza, grilled meats and salads. But it's not just Italian cuisine, many Mexican, Spanish and Greek recipes rely on the delicious dried leaves of the oregano plant. Read more about the plant. It's a hardy perennial, and just a handful of plants either on your kitchen windowsill or in your garden will give you plenty of fresh herbs for the summer, and enough to dry and use all winter long. There are a few varieties worth growing from seed: Origanum vulgare, Origanum heracleoticum and Origanum marjorana. Whilst not a true variety, and for something a little different, Mexican oregano may be worth a go. Read more about this type. You can start growing the herb from seeds, divisions or cuttings. You can start it from seeds indoors in temperatures of 15-20°C (60-68°F), and transplant once the risk of frost has passed. Using a general potting or seed compost, thinly sow the fine seed in plugs or trays. Plant your seedlings outdoors in well-drained soil, and in full sunlight; planting them about 8-10 inches (20-25 cm) apart, as they will also spread out a bit, and will send out runners. This herb prefers being on the dry side, so unless it's really dry just water 1-2 times a week. They don't need any fertilizer. Although I do give them a liquid feed in autumn/winter after I've cut them back. In spring/early summer, snip off a 3-4 inch (8-10cm) piece from a new growth. Remove the lower leaves and plant in a pot filled with a cutting compost. Water and plant out once they are growing strongly. Use a general potting compost and in spring/early summer plant your seedlings, cuttings or divisions. After they've flowered cut right back and give a liquid feed. You can divide your plants when the centres start to die out, or when the stems become very woody. This will keep the plants healthy, and will provide you with new plants. In spring dig up an established plant and gently seperate into 3-4 divisions, replant. Nothing much to worry about here. Keep an eye out for spider mite. It’s time for harvesting when the plants reach about ten centimetres tall, and have at least a dozen leaves. Try to pick your leaves in the morning, just after the dew has dried. 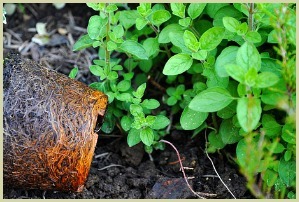 You'll then get to enjoy the oregano oil contained in the leaves, before the sun warms them up and dries them out. Read more about this healthy oil. Use them fresh, store them in plastic bags in the refrigerator or freezer, or dry out the leaves for longer use. Early Spring: Sow seeds. Spring: Plant out any seedlings, root divisions or cuttings.Summer: Harvest after flowering and cut back. Autumn: Harvest some more for drying and winter use. Winter: Cut the stems back to a 3 inches (8cm) above the soil. Protect young plants with mulch or fleece.